The Liars Club: LIVE FROM PATAGONIA! Well, we're all here in San Martin, Argentina with three days of fishing under out belts and we've just finished off the evening meal of world famous Argentine beef and Malbec wine topped off by a lemon pie (sort of an ice cream really) encrusted in white chocolate and drizzled in a rasberry compote topped with a fresh freca julienned. How's that for starting out a fishing report? The four of us, Paul Vogt, Robert Cain, John McGarity and myself are just stunned by the hospitality of our Andes Drifters hosts and staff as well as the quality of the fishing. And, the fishing has been awesome. The weather is the best we could have asked for (mid 80's during the day and low 50's at night. We sleep with the windows wide open. They have no screens but there are no bugs here to worry about. Our day begins at 7:30 AM with breakfast and by 8:30 we are on the road to whichever river we're fishing that day. 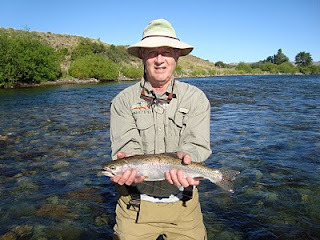 Our first two days of fishing were an overnite trip on the Chemihuin (Chemmi When) and Collon Cura (Koshon Cura) Rivers. We did about 14 miles each day. Man, am I glad I'm not a fishing guide here where you have to row a raft that many miles each day. Today (Tuesday) we waded the Malleo (Ma Sha O) with the intention of casting dry flies to rising fish but the wind and water levels were both too high to strictly fi sh on top. We caught some big fish on dries but it was pretty technical so when the guide asked if I would like to try a nymph, I, of course, jumped on the opportunity. 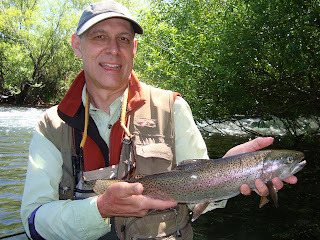 In the next 20 minutes, I landed 5 or 6 huge rainbows. OK, I'm rollin' now; it's just like home, only better. The Dredger would have been proud. Tomorrow we head out for another overnight float trip before ending the week,hopefully, fishing for big browns that are following minnows up the river from the lake. The overnight trips are a lot of fun (& this comes from a total non-camper). I'll try to give you another update before we begin the trek home on Saturday. Jimmy, You need to stop posting this stuff. Your making my mouth water!